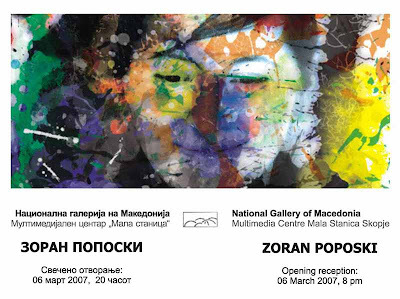 A solo exhibition by the visual artist Zoran Poposki opens to the public at the National Gallery of Macedonia, Multimedia Center Mala stanica in Skopje on 06 March 2007, at 8 pm. The exhibition comprises large-scale digital prints and photographs from the cycle “Hush”, created in 2006-2007. Poposki’s work explores the hidden interconnections between the visual and the written word. Or more specifically, how pictures and narratives are intertwined in the attempt to tell our personal histories, but at the same time they subvert each other, their union sometimes producing unexpected (even ironic) results. Zoran Poposki has exhibited in the US, Germany, France, and Macedonia. This is his eighth solo exhibition.